Tired of Chain ‘O Lakes birding posts yet? Fine, let’s shake it up a bit and feature something different, something unlike the other recent posts. Today I bring you a post from the birding outing that my brother Ron and I took at Chain ‘O Lakes. Ummm, maybe that doesn’t completely fit the definition of different. Yes, it is another post from the Chain, but this time it isn’t about a bird. Nope, today’s featured subject happens to be an animal I’ve never seen in the wild before. 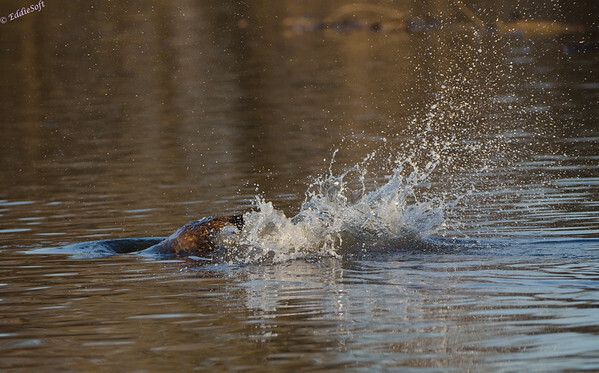 Now I’ve seen a lot of Muskrats in my day and one might think those are Beavers if they have never seen one before. They live in a similar environment and kind of look alike from a brown furry animal that swims in the water perspective but to be honest, you can tell the difference pretty quickly in the field. 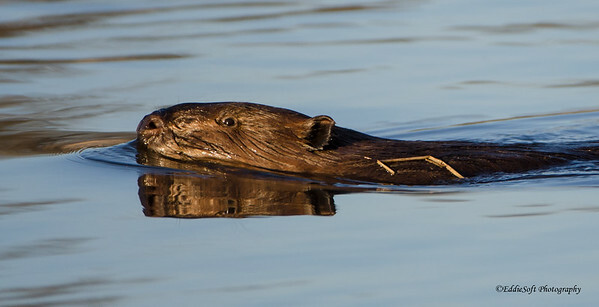 First off, the Muskrat has a skinny “rat” tail compared to the paddle the Beaver sports. Although relative sizes are tough to judge when you don’t have both animals close by, the swimming rat is significantly smaller than the Beaver. I didn’t realize exactly how much until Ron and I stumbled on this one swimming in a remote part of the Fox River that cuts through the Chain O’ Lakes park. Quite surprisingly, it could care less that we were even there – some of that may be the fact there was another one – possibly the mate – that was cruising through the water ahead of it – note, I have NO idea how to tell the sexes apart based on the angles we had. None of them ever made it onto land so these are the best looks you are going to get. I can bring you in closer though! It just kept swimming past me giving plenty of time to keep the Beast trained on the subject. Pretty soon it was just off shore from Ron and I, which started some internal debate (eesh, talking to myself in the last post, talking to myself in this post.. this is not a good sign). Since I’ve never encountered one of these fur balls before I wasn’t entirely sure how safe it was to be around them. Unlike with Bears I definitely wasn’t going to act like a tree if it attacked! Then again I can probably run faster than Ron so my chances were good! The one thing I wanted to see was the tail. That was the distinct feature that sets them apart in the wild (well, that and the teeth I guess). Sure enough, the Beaver decided to show it off for me. Out of the water it came only to slam back down on the surface with a thunderous splash. That was cool and managed to startle me enough to MISS the shot. Sorry about that, but you can see the aftermath once the brain to finger signals were re-engaged. That memory will likely stay in the banks for a very long time. Just like the scene in The Naked Gun that has been with me all those years .. just waiting for a good time to dust it off and put it out as a post tile for everyone to get high school chuckle once again. Hope you enjoyed the post – quick one tonight as tomorrow looks to be an early riser. Before I forget, a big heartfelt appreciation to those willing to risk their lives to give us the freedoms we often take for granted in our daily lives. Hats off to you, especially those who gave the ultimate sacrifice. Those that have served before and those serving now deserve our highest respect – remember them on this Memorial Day weekend. Nice shots… Apparently there are beavers all over out here, and one of our friends used to regularly trap them by a house he had along a river because, if they dammed up the river, his basement flooded. He did invite us out to take pictures one time, but we never made it. Awesome – can’t imagine what people would think when they overheard that – and yes I imagine a hernia trying to hold back the laughter (well, maybe that is just me – ha). How is the photography going out there?